Kevin focuses his practice on insurance coverage litigation by pursuing claims for insureds against their insurance companies. Kevin was born and raised in south Florida. 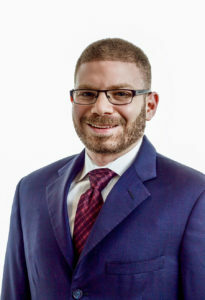 After receiving his Bachelor of Science in Building Construction from the University of Florida, he attended law school at Nova Southeastern University, where he received his Juris Doctor degree. Kevin’s entire legal career has been dedicated to first-party property insurance. After law school, Kevin worked for and rose the rank of “partner” at a prominent South Florida law firm, where he represented and defended some of Florida’s largest property insurance carriers in first party claims. During this time, he learned the inner workings of insurance companies, how they evaluate and value claims, and their litigation strategies. After defending insurance companies for years, he now utilizes all of the knowledge gained against the insurance carriers to assist homeowners in getting the best settlements possible. In his free time, Kevin enjoys spending time with his family, playing basketball with friends, going to the park with his dog Riley, and dominating his fantasy football league.